Tactile Indicator Supplier Australia. Tactile Ground Surface Indicator Manufacturer and supplier. 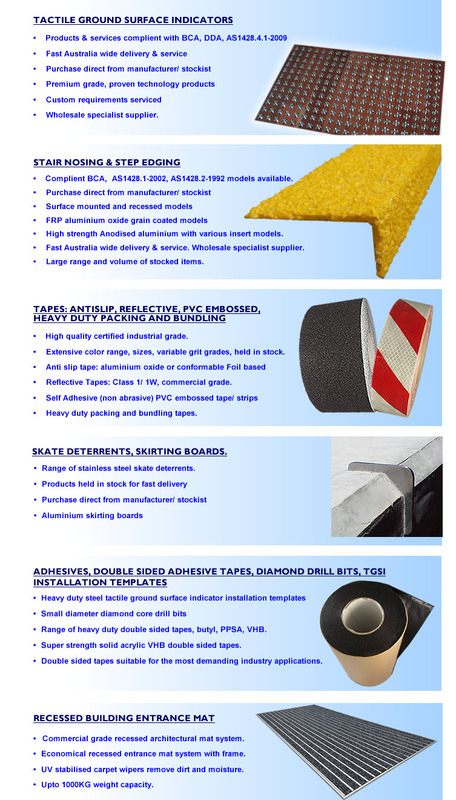 Stair nosing supplier, Non slip and Anti slip tapes supplier, Reflective tape, Industrial safety floor gratings. Entrance mat systems, skateboard deterrents, aluminium skirting board. Range of tactile indicators. Online store. Adelaide, Sydney, Melbourne, Perth, Darwin, Brisbane, Hobart. TGSI supplier Australia. Aluminium skirting, DOUBLE SIDED ADHESIVE TAPES, ENTRance MAT SYSTEM, SMALL DIAMETER DIAMOND DRILL BITS. TGSI Pty Ltd is an Australian Company that specialises in supplying a range of building and safety materials Australia Wide. International delivery of certain products is provided for also. Products featured in this website are generally held in stock and available for prompt dispatch to Australia wide destinations. Products offered include: Discrete and directional tactile ground surface indicators (TGSI's), stair nosings/ stair edge strips, range of adhesive tapes (reflective, anti slip, double sided), skateboard deterrents, and other building related products (eg. entrance mat system, skirting board). Extensive range OF proven quality stocked items, fast dispatch and delivery Australia Wide.